Here are the entries received for the Transnational Ecologies Audio and Image contest. 4 photos: The first three are of snow geese that stopped for rest in our fields near Ste-Rose (Ontario) during their migration this Spring. The event was notable for two reasons. 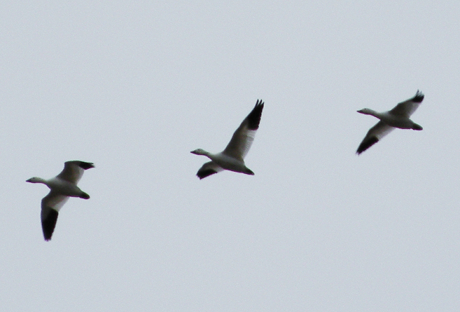 First, it was the third year that a flock of snow geese stopped nearby. According to local farmers, prior to that, the birds had not been seen in the area for over 40 years. 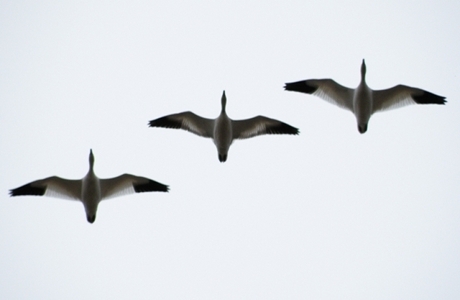 The other reason why it was notable was that the flock of snow geese travelled with Canada geese, whereas usually the two do not travel together or share the same feeding ground. This change in migration patterns is thought to be the result of changing agricultural practices, climate and bird population (which has grown exponentially since the 1970s). 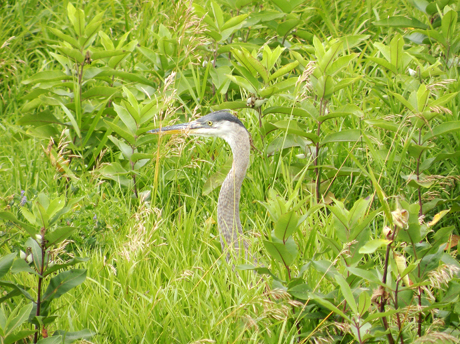 The last photograph is of a heron which also spends weeks in our backyard near Ste-Rose (Ontario) every Spring and Fall ever since a large landslide in a nearby village has changed the flow of the watercourses on our farm. The new wider, shallower, stagnant water pools in the Spring and Fall offer the perfect feeding ground for the herons on their yearly migration. 1 video: Crows pose an interesting case of migration. Crows are year-round residents in many parts of southern Canada and are migratory elswhere in their range. 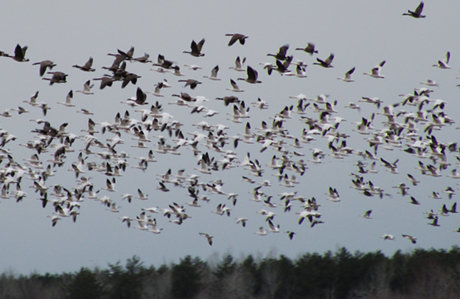 Here, in Ottawa, they remain throughout the winter, but make local daily movements along ‘flyways’ to communal roosts that grow in the fall and winter, and diminish in the spring and summer. If you look up into the sky in the hour or two before dusk, you may notice a lazy string of crows that resolves—if you keep watching—into a noticeable west-to-east movement involving hundreds of birds. I think of this as the crow rush hour: a flow of traffic that increases as crows in twos and threes join the commute home to the roost. These pictures document an instance in winter when I found myself under such a ‘commute,’ and hurriedly took photos of the crows as they flew past. Some of them flew quickly and directly through the sky while others swooped and dove, seemingly engaged in play with their fellow crows. I made the recording later, as I passed through Ottawa’s Central Experimental Farm this past fall. Canada Geese and crows had stationed themselves in the farm in the hundreds: the geese to glean the grain and soya fields that had been harvested in the previous weeks and the crows to raid the standing corn that rustled dryly in the breeze. 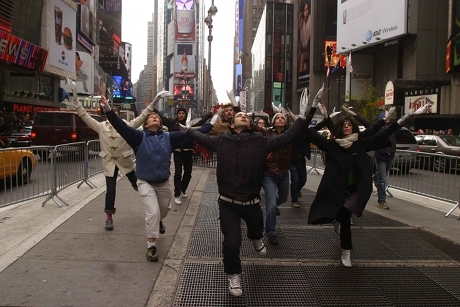 1 photo: This photo is by Andrew Lichtenstein and is a photo of a Flocking Dance performed in the Fall of 2003 in Times Square in New York City. These dances were part of Jennifer Monson’s BIRD BRAIN Ducks and Geese Migration that followed the migrations of ducks and geese up the Mississippi flyway from Corpus Christi, TX to Duluth, MN. While visiting Kitchener in the late summer of this year, I walked down to the Grand River floodplain. Undeveloped, the floodplain is a swath of old field habitat, filled at this time of year with native Goldenrods (Solidago sp.). I was amazed at the number of Monarch Butterflies (Danaus plexippus) that were on the move this day; as I remember it, there was a light breeze coming from the south, and I watched these Monarchs fly from plant to plant on a journey that would see them arriving in Mexico by late October. 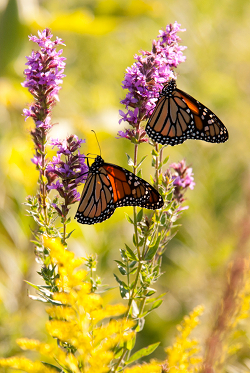 Curiously, while the fields were full of the yellows of Goldenrod, the Monarchs were most interested in feeding on Purple Loostrife (Lythrum salicaria). Considered an invasive species, Purple Loostrife prefers to grow in the moist soil found near the Grand River. This relationship between migrating native insects and introduced “invasive” plant helps to complicate ideas of non-native species—the Monarchs that I watched on that day were clearly fuelling up for their flight on the nectar provided by this maligned plant. Migration is fraught with risk for those organisms that undertake these temporal movements. This is a Black and White Warbler (Mniotilta varia) that I found dead at the base of the apartment building I live in one late summer day. These migratory bird-building collisions are a serious concern in urban areas and with ever-expanding urban environments, an ever-increasing number of individuals are killed each year. 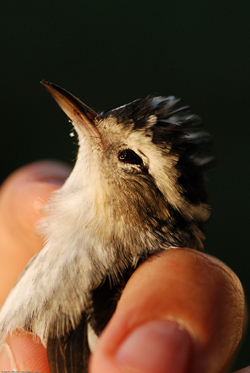 In a city like Toronto, a group of volunteers associated with the Fatal Light Awareness Program patrol collision “hotspots” and rescue distressed birds for rehabilitation and re-release. I explore in my doctoral work how these acts of rescue is an expansion of human social worlds and is an important service in a multi-species city. Toronto is sometimes thought of a place where birds spend their summer, or a place birds pass through on their way to breeding or over-wintering grounds. 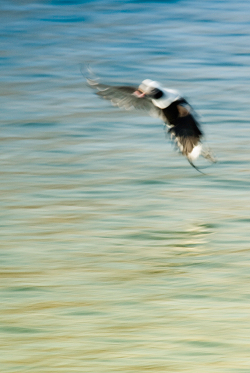 Less well known is its status as a destination in the winter—but this is the case with the Long-tailed Duck (Clangula hyemalis) which is seen here (impressionistically) coming in for a landing on the surface of Lake Ontario. I’ve had a chance to see the Western population of these ducks in their breeding grounds—tundra ponds in the Yukon, but nothing signals the arrival of winter than the charismatic sounds of these diving ducks heard while walking along the Leslie Street Spit or Humber Bay Park. 3 audio recordings: The three recordings were made on May 17, 2008 using a Manantz PMD670 digital recorder with a Sennheiser shotgun microphone, which were provided and mostly wielded by my dear friend, Bryan Nuse, who also taught me to know birds and plants. By this time of year, summer-resident migrant songbirds have mostly returned to middle Georgia, where these recordings were made. The recordings were taken successively at three memorialized sites of cultural heritage in adjacent Putnam and Baldwin counties. The first recording begins in a clearcut next to the 2,000 year old Rock Eagle effigy mound near Oconee National Forest, and it includes the sounds of our conversation as we climbed the observation tower as well as a reading of a placard that describes the site. The second recording is from Ward’s Chapel where Alice Walker was baptized and attended services as a child; the chapel is marked by a sign on the Alice Walker Driving Tour which is read aloud in the recording. The last recording is from Andalusia, a former dairy farm outside Milledgeville where Flannery O’Connor lived and worked from 1951 until her death in 1964. We ended up on this literary landscape excursion because I had organized an optional field trip for students in an Introduction to Literature class that I was teaching at a technical college in Athens, Georgia. In the class we were reading and discussing some short stories by Alice Walker and Flannery O’Connor, so I thought it would be interesting to visit the former homes of these writers. However, none of my students were able to make it, and the two friends who came with me were very happy to spend the day ambling about and observing the natural setting of these historic sites. The birding was quite excellent on this occasion as the recently returned migrants were eager and steadfast with song throughout the day in this part of the season when territories are most at stake. 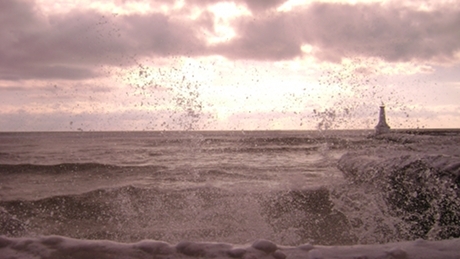 It is worthwhile to consider the movements of tourists and of peoples; the movements of story, of texts, and of history; and the movements of species, migratory or otherwise, especially as they intersect in such designated and narrated spaces of memorial—spaces that are explicitly inscribed with meanings and markers. Late in the afternoon, we read Walker’s “Everyday Use” aloud beneath a grand American elm on the porch of her childhood home, and it was hard not to identify the elm in her fictional story with the one giving us shade as we read the words: “A yard like this is more comfortable than most people know. It is not just a yard. It is like an extended living room. When the hard clay is swept clean as a floor and the fine sand around the edges lined with tiny, irregular grooves, anyone can come and sit and look up into the elm tree and wait for the breezes that never come inside the house.” On our walk through Andalusia, the vivid sounds and colors of spring jumped out at us in our unhurried wanderings much as O’Connor’s deftly rendered settings work to punctuate the heavy dramas that unfold in her stories. But identification – ah, this must be the tree, the very tree – isn’t the right way to imagine such intersections. With movement there is always something of a parallax. The migratory natures presented here are of particular importance in the comings and goings of my own life. For years I have driven back and forth past these three landmarks, each of which lie very near to highway 441. I have frequently depended on these spots for a break from driving as I made the four-hour trip between my parents’ home in south Georgia and Athens, where I attended university and worked. I have come to know them as spaces between, as momentary constants in repeated movements. But these are also places that connect out from their fixed locations, beyond but also through the sensual and emotional connections made by individuals on the ground. Places stretch out along the trajectories of stories somehow native to them to inhabit histories and canons and classrooms and all sorts of distant lives, and they also move along paths of migratory species, such as our own, connecting out to broader complexes of ecology and history, buffering the strictness of boundary-making and boundary-marking enterprises that divide and dissect us. In migratory visiting and through various means of memorializing, specific places are experienced in innumerable moments of becoming—becomings that enable place-stretching movements of meanings between particulars. We hope these recordings are alive with such interconnected, transnational, and boundary-exposing migrations, and that they might give us occasion to reflect on the movements of boundaries across our bodies and through our relations in whatever spaces they occur.